Kindred: Grace, full of PRIDE! March in the Pride Parade. Tomorrow, Grace will parade down Westheimer with 200,000 cheering spectators. This year Grace will have a circus theme, as we welcome all under out big tent. 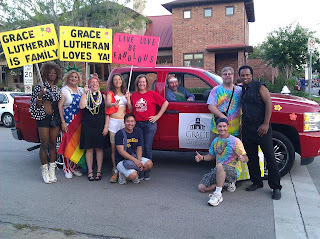 Grace Open House: Stop by Grace tomorrow anytime before the parade! We'll offer bottled water, snacks, and bathroom facilities to folks on their way to/from the Festival.